Several cool things have been going on around here, so I thought I’d put ’em all in one post! First up, the Paw Project! As you might recall, during November and December, I vowed to donate all royalties I received from my No Declaw tote bag to this awesome organization, which has the goal of educating humans about how awful it is to declaw cats, and to encourage them to outlaw declawing. My goal was to sell 20 totes, and I wound up selling 14 for a total of $20.07 in royalties. 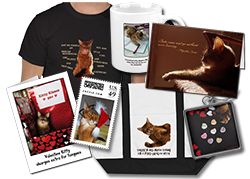 My human rounded that up to $25 and sent it in, not realizing that currently, with a minimum donation, they will send you a copy of the Paw Project DVD! My human was really surprised when it arrived in the mail. Since declawing is already illegal in Los Angeles, my human wanted to send the DVD to someone who could use it. It turned out that somebody she knows in Seattle had recently seen the movie and was fired up to do work towards outlawing declawing up there, so she sent the DVD to them. We got these in the mail around the same time. If you follow Bugsy and Knuckles and their artist human, Lou Belcher, you might recognize them! They were part of the 30 paintings in 30 days challenge that Lou took last month. You can see all the paintings from that project here. My human was really drawn to these two paintings — she loved the colors — and she kept staring at them. Finally she had to break down and buy them, and she is really glad she did because they are even prettier in real life than they are on the computer screen! They are kind of iridescent. There are other paintings that are still available, so check them out. Lastly, I found that Lay’s potato chips was having a contest where you could make up your own chip flavor and compete for a million dollar prize! Well, you know I was all over that! Do you realize how many cat trees and buckets of KFC that would buy? 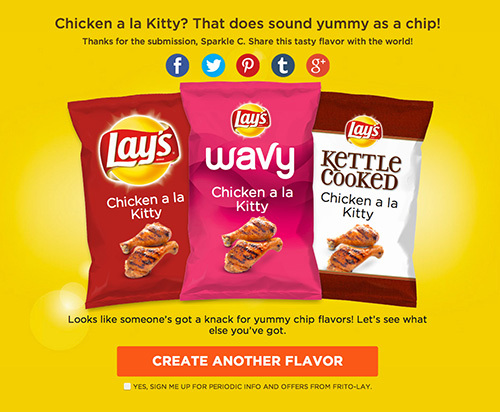 So I entered my own flavor: Chicken à la Kitty! It is chicken (duh) and catnip, plus added taurine, because it is a supplement we kitties all need! If you want to vote for it, you can do so here. Actually, the votes don’t really count towards winning — human judges are going to decide based on flavor. I think the votes are just for fun. But it’s still cool to see my flavor have so many more votes than most of the other ones humans are coming up with! That’s great to hear that there is progress being made against declawing! We had not heard about the Paw Project or that it was illegal in LA. Hopefully it will be illegal everywhere soon. We love your chip flavor, Sparkle! Sounds delicious — we would eat them up, for sure! Lots of fun stuff Sparkle 🙂 Your chip flavor is very creative. We LOVE your chip flavor!! We didn’t realize that declawing is outlawed in LA. That’s great news. We wish it was the same everywhere. Those paintings look terrific, I will go check. 30 painting in 30 days is quite a challenge for any artist! I am really pleased you were able to give the video a good home – declawing is utterly shocking and inexcusable – I cannot imagine its use to anyone except an human of the utmost selfishness. Luckily declawing is illegal in England. Nice donation and chips! We hope the declawing word spreads, it’s just inhumane and it’s surprising it’s still allowable in most places in the US. We just hope if it is banned, that people don’t dump their cats if they can’t declaw them. You know some people will because that is what is easiest. Your chip has to win if they judge it on taste! Outlaw declawing! Concats on Paw Project! We agree with the chip flavors. You guys have been SUPER busy!!! Way cool, Sparkle! 🙂 concats on your support for the Paw Project. we love your chip flavor too! The Paw Project is a great cause! It’s pretty neat they sent you an unexpected DVD, and even better that you found someone who really wanted to see it. That was a worthy donation to make. I find it incredible that a country like the US has not made declawing illegal in all states. The paintings look lovely. What’s there not to like… chicken + nip = yum! Concats on the Paw Project donation! We hope everybody learns that no kitty should ever be declawed! We love the paintings your human got! Our mommy would have got that heart one too since she loves things like that. 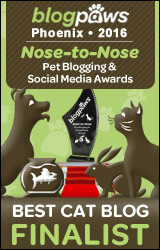 The Paw Project is pawsome!! My humom thinks that a requirement for getting you kitties declawed should be thats their human has to be declawed first..that should puts an end to it real fast..MOL..We also voted for your chips flavor..My uncle Chang would love these..he comes running every time he hears a chip bag being opened..
Great job with the Paw Project. I hope you win the million dollars and then you can start your own Sparkle Chip Company! we love Lou’s artwork. we are glad your friend will be able to put the dvd to good use. Cool stuff for sure…we love your Chicken a la kitty chips and we wish you tons of luck in the contest…you’re right that would buy LOTS of KFC and help lots of kitties too! We love the two paintings you got from Lou’s latest Challenge, they are beautiful, we really enjoyed all her paintings from the Challenge. Wow, lots of coolness! The one that makes us laugh is the chips! Just think of the new market segment they could open by advertizing chips for cats! MOL! It is great to read all about your activities. You are one busy household! When I started reading the first cat blogs in 2006 I heard about declawing a cat for the first time in my life and was horrified ! I didn’t even know that such a cruelty existed. Nobody even would think about that here and a vet would certainly refuse to do it. I am sure that it is illegal in all European countries. Why do people such an awful thing, they don’t want to live without fingernails either ! A cat without claws is so helpless ! We voted for your chip flavor! WE think it should win. We keep hearing so much about the paw project but haven’t seen it yet! They asked us to include Catalogue in their tour last year but then changed people and the communication all fell through and it didn’t happen. I’m glad they’re having such great success with so worthy of a cause! Oh, and we voted for your chip flavor! Very fun! …and love the name. We really hope the Project is successful. Declawing is unspeakably awful. That Paw Project is a great thing. I hope it serves to keep people from declawing their cats. Those paintings are pretty. Lou is really getting good at the painiting. Great flavor for the potato chips. That was a terrific donation Sparkle and hopefully that DVD will help! Chips sound yummy! Concats to your Mom for getting those two lovely cards. We think your chicken and catnip chips would sell like wildfire. 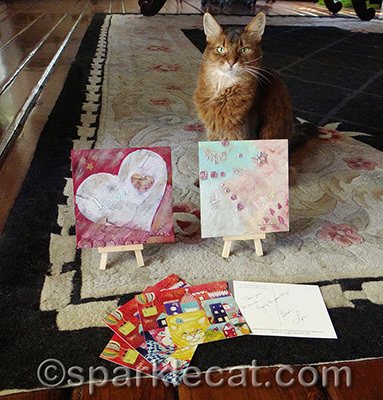 Sparkle, we love HH’s paintings…we can see why your human bought those two. And we would definitely eat those chips. Cool stuff! We voted for your chips!!! Congratulations on The Paw Project! Those chips look Yummy! Congrats on the Paw Project. That was a great donation. We like the artwork your Mom got . WE really like the chips! !